Mundulkiri Province, Cambodia, November 2018 – In the village of Puyam in Mondulkiri Province, a school director is attempting to both advocate for inclusive quality education and create a school support system that responds to evidence generated from the community. With training assistance provided by the Ministry of Education, Youth and Sport and inputs from UNICEF and her own force of personality, Chem Sopheak has created an ideal learning environment for increased learning through multilingual education at Puyam Preschool and Primary School. I met Chem Sopheak at the Mondulkiri Provincial Discovery workshop for the evaluation of the Multilingual Education National Action Plan (MENAP) commissioned by UNICEF. Chem Sopheak expressed her gratitude for being able to speak in at the workshop where ministry officials, parents from indigenous communities, and multilingual education school teachers were present. Developed by the Cambodian Ministry of Education, Youth and Sport (MoEYS) in 2015, MENAP expanded the reach of multilingual education throughout Cambodia’s four north-eastern provinces (Kratie, Mondulkiri, Ratanakiri and Stung Treng), while also providing multilingual education training to teachers from indigenous communities. Ms Sopheak explained how she rose from being a teacher at Puyam Primary school to being selected by both the Provincial Office of Education and the Puyam Commune Council to replace the outgoing school director. From day one on the new job, Ms. Sopheak wanted to ensure that the education offered at Puyam Primary school directly met the expressed needs of her community. Having seen children from ethnic minority communities excited to learn in their mother tongue in three nearby multilingual education schools supported by the MoEYS, UNICEF and NGO CARE, Ms. Sopheak lobbied the Provincial Office of Education to start a multilingual education preschool in Puyam. Despite her village having a low percentage of children from indigenous communities, she wanted to implement a multilingual primary school to ensure that no child was left behind. In its first year implementing multilingual education curriculum, Puyam preschool is already seeing the benefits of a mother tongue-based education as parents are motivated to send their children to school lessons that are taught by a member of the Bunong indigenous community. Since 2014, UNICEF has supported the implementation of multilingual education in Cambodia by supporting teacher training programmes in Kratie, Mondulkiri, Ratanakiri and Stung Treng Provinces. 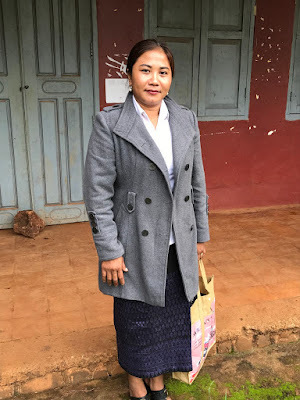 Not only content in encouraging inclusive quality education and multilingual education in Puyam, Ms. Sopheak understands the immense value of data collection for evidence-based policy and decision-making. While her role explicitly states that she maintains data on her school, Ms. Sopheak has gone above and beyond her responsibilities after noticing that previously collected demographic data on children didn’t tell her what she needed to know to help students from indigenous communities. “I needed separate data for each school. We made a team to collect data from all the different groups in the village,” Ms. Sopheak recounted. Collecting this demographic household data allowed her to track the enrolment status of all school-aged children in her commune and note which students could benefit from multilingual education. Again, not satisfied with simply collecting the data to sit in her expansive bookkeeping system, Ms. Sopheak created and hung poster boards detailing relevant annual data in her classroom, so that teachers “could reference the data” in case of her absence—probably while she’s out collecting more data. UNICEF encourages decision-making grounded in evidence generated from its evaluations. By commissioning the evaluation of MENAP, UNICEF will provide evidence-based findings to inform the drafting of a second Multilingual Education National Action Plan in March 2019. By participating in the evaluation of the current MENAP as a commune-level implementer of multilingual education, Ms. Sopheak is contributing valuable information that will assist the drafting of the second MENAP. Ms Sopheak truly values multilingual education and inclusive quality education for children in her community. While Puyam currently only has multilingual curriculum in the preschool, Ms Sopheak hopes that Puyam Primary School will soon be able to implement a full multilingual education programme at the primary school.